Create conditions in an “If This Then That” style to decide how rows will be displayed. Plays nice with Beaver Themer, shortcodes and the website visitors location (from their IP address). GDPR eat your heart out! 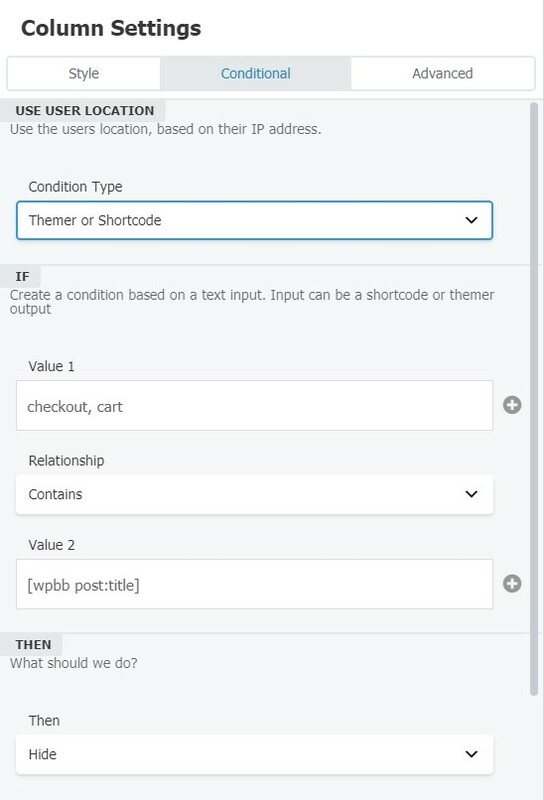 The Beaver Builder Conditional Rows and Columns plugin lets you control the visibility of any of your rows according to the user’s location, or themer/shortcode output. Make sure you have installed the Beaver Builder plugin and the Beaver Builder Conditional Rows and Columns plugin into your site. Step 1: Access the page builder through the page you wish to edit. Step 2: Click the Row Settings icon on a row you wish to edit to set the conditions. Step 3: Head to the Advanced tab, scroll down and set the Display Visibility to Conditional. Step 4: Next, head to the newly visible ‘Conditional’ tab. Then you can select between location based conditions, or themer/shortcode conditions. Enter the country code/s of the countries you wish to be added into the conditional visibility. Set whether you wish to hide or show the rows to the countries with the codes you entered. Note that this will not work if you enter country names. Only country codes are accepted. Use this as a reference for country codes. Tip: Use the code EU to target all countries within EU. 1.2 – Add location condition – GDPR!